A GIVEAWAY with Parabo Press and a Special Discount for You! It’s no secret that I’m a true believer in printing your photos! I believe the best way to enjoy the images of your family is to print them, display them, see them daily on your walls or in an album on your coffee table. (Unless, of course, you have little kids like mine who would totally ruin an album sitting on your coffee table. In that case, I hope the album is up on a shelf away from small hands but still visible. 😉 It makes me SO happy to go into a client’s home, a friend’s home, a family member’s home and see that they have photos hanging on their walls. It tells the story of your family to all who enter and allows you to really enjoy the images that you love most. To honor the love I have for the printed image, I’m so excited to announce that this month I’ve partnered up with Parabo Press for a fun GIVEAWAY of $50 to their online store– and just in time for the holidays! Parabo Press is a great company that creates awesome printed products of your photos, and while this giveaway is sponsored by them, I was a lover of their products long before this partnership and have sung their praises to clients and friends alike. Take a look at their site and you’ll quickly see how much fun stuff they offer to get your images off your computer screen and into your life. To enter the giveaway contest, simply head to Instagram, follow both @heatherkincaidphoto and @parabopress, and tag two friends on my post from today (November 29th). The winner will be chosen and announced on Friday 12/1 at 9am PST, so make sure to enter before then! 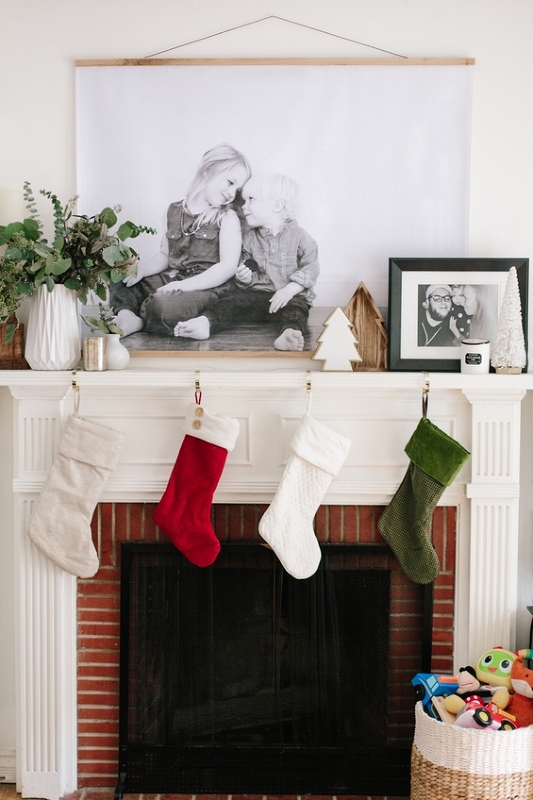 Anyway, enough of my questionable parenting methods- I LOVE the way this print turned out and love what it has done for my mantle, especially now that we have decorated for Christmas. I have another black and white engineer print in my kids’ room and think these are such a special and simple way to bring personality into your space! I hope you’ll all take a minute to enter the contest for your chance to win a $50 gift card! Your walls will thank you! And in the event you don’t win the contest, Parabo Press is still offering 50% off engineer prints for anyone who uses my special code KIN50 – So basically, everyone can be a winner!